Starting with publication of the first comprehensive global map of leatherback turtle nesting in SWOT Report, vol. 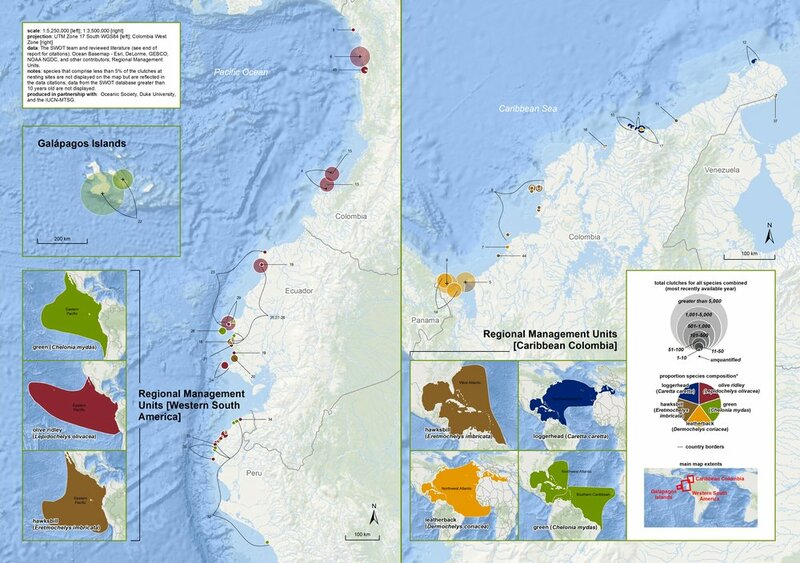 I in 2006, the SWOT Program has produced a variety of printed maps of sea turtle biogeography. Maps produced by SWOT have included the first comprehensive global maps of nesting distribution and abundance for all seven sea turtle species, continent-scale maps of nesting and satellite telemetry data for South America and Africa, national-scale maps of nesting for Costa Rica, the French Territories, and Japan, satellite telemetry of loggerhead turtles in the Pacific Ocean, and more. Our map of “Worldwide Green Turtle Nesting Sites” was awarded ESRI’s prestigious International Conservation Mapping Grand Prize in 2011. Loggerhead Turtle Satellite Telemetry Data in the Atlantic Ocean (data citations) | SWOT Report, vol. XIV (2019). Biogeography of Sea Turtles in the Mediterranean Sea (data citations) | SWOT Report, vol. XIV (2019). Loggerhead Turtle Satellite Telemetry Data in the Pacific Ocean (data citations) | SWOT Report, vol. XIII (2018). Nesting Biogeography of Sea Turtles in Japan (data citations) | SWOT Report, vol. XIII (2018). Nesting Biogeography of Sea Turtles in French Territories (data citations) | SWOT Report, vol. XIII (2018). Nesting Biogeography of Sea Turtles in Atlantic Africa (data citations) | SWOT Report, vol. XII (2017). Nesting Biogeography of Sea Turtles in the SW Indian Ocean (data citations) | SWOT Report, vol. XII (2017). Sea Turtle Satellite Telemetry Data Originating in South America (data citations) | SWOT Report, vol. XI (2016). Sea Turtle Satellite Telemetry Data Originating in Africa (data citations) | SWOT Report, vol. XII (2017). Nesting Biogeography of Sea Turtles in Western South America and Caribbean Colombia (data citations) | SWOT Report, vol. XI (2016). Nesting Biogeography of Sea Turtles in Northern South America and Brazil (data citations) | SWOT Report, vol. XI (2016). Strandings in South America | SWOT Report, vol. XI (2016). Nesting Biogeography of Sea Turtles in Costa Rica (data citations) | SWOT Report, vol. X (2015). Worldwide Green Turtle Nesting Sites (data citations) | SWOT Report, vol. VI (2011). Green Turtle Satellite Telemetry and Genetic Stocks (data citations) | SWOT Report, vol. VI (2011). Global Biogeography of the Olive Ridley (data citations) | SWOT Report, vol. V (2010). Global Biogeography of the Kemp’s Ridley (data citations) | SWOT Report, vol. V (2010). Global Biogeography of the Flatback (data citations) | SWOT Report, vol. IV (2009). Japanese Bekko Imports by Region, 1950–1992 | From “Trade Routes for Tortoiseshell” in SWOT Report, vol. III (2008). Worldwide Hawksbill Nesting Sites, 2006 (data citations) | SWOT Report, vol. III (2008). Worldwide Loggerhead Nesting Sites 2005 (data citations) | SWOT Report, vol. II (2007). Worldwide Leatherback Nesting Sites 2005 (data citations) | SWOT Report, vol. II (2007).